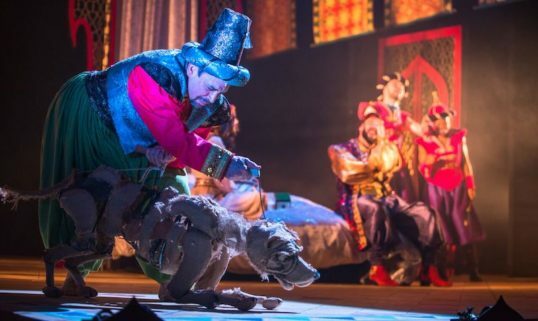 Beautiful to look at and clever enough to know when to be stupid, The Arabian Nights at the Lyceum is genuine family Christmas entertainment. One Thousand and One Nights (as it was originally known) is an ideal inspiration for a portmanteau show such as this one. It drew on a variety of traditions for its stories, and some of the most celebrated – such as Aladdin, Ali Baba or Sinbad – were only added later. The presentation here draws on a variety of storytelling traditions and theatrical techniques both ancient and modern, with performers from a more diverse background than is usual in a Christmas play. 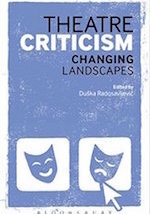 This leads to a freshness, modernity, excitement and inclusivity that is far from the troubling ‘Orientalism’ of some such adaptations. Writer Suhayla El-Bushra and director Joe Douglas have come up with a playful, cleverly structured and visually arresting production that should appeal to all ages. The jeopardy that faces central character Scheherazade (a wonderfully energetic and expansive Rehanna MacDonald) is somewhat toned down from the source material, with the threat of being executed after her wedding night being replaced by a desire to free her mother and her friends from the tyrannical Sultan. However, there is still enough peril in evidence. Indeed, there is one moment towards the end, dealing with the limitations of stories to do good, that is genuinely upsetting – although admittedly more to the adult members of the audience. There is plenty to entertain younger spectators, however, from copious jokes about farting and dung to some excellent talking goats. 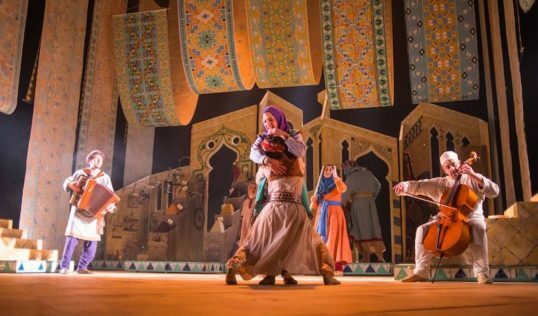 The tales Scheherazade tells to divert the Sultan are varied and full of surprises. Scheherazade’s story itself, meanwhile, is naturally being narrated by a flatulent enchanted dog. The versatility and craft of a tremendous company mean it is constantly inventive. 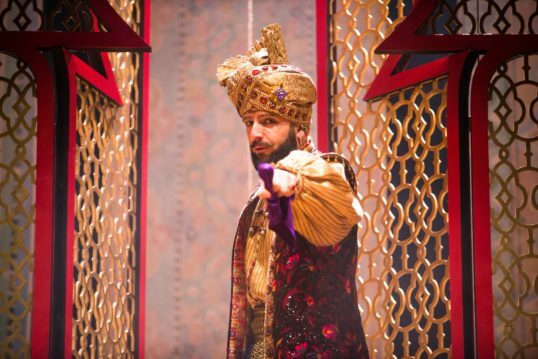 Nicholas Karimi’s Sultan is a beautifully complex and human characterisation, while to single out any of the other performers would be unfair, as they are uniformly striking and extremely funny, as well as tuneful interpreters of Tarek Merchant’s music. Douglas and designer Francis O’Connor conjure up a parade of seemingly effortless and ravishing effects; some moments of theatrical sleight-of-hand show how magic can be created without recourse to technology. There is also some clever puppetry alongside some truly wonderful use of shadowplay and projection. There are certainly a couple of moments that are less secure. The scatological humour is overplayed, while the narrative, utterly secure in the first act, becomes tricksy for its own sake midway through the second half before reaching for a profundity that fails to ring entirely true. As an entertainment, however, there is so much to recommend here. In particular, this production – recommended for ages 5+ – would be an ideal introduction to ‘legitimate’ theatre for children. This is because it combines challenging yet accessible subject matter with that sprinkling of magic that makes for an ideal Christmas show. Tues – Sat evenings at 7.00 pm. Matinees Wed and Sat at 2.00 pm. My wife and I have just come back from seeing this show with our 5 year old grandson. He sat on the edge of his seat throughout the show, entranced and involved – as were we. The wit, style and magic of the re-worked stories, the set, the costumes, the music, the lighting and the excellent skilled and perfectly pitched performances created a wonderful entertainment of the highest quality which will stay long in all our memories. Sincere thanks to all involved in creating this superb show.